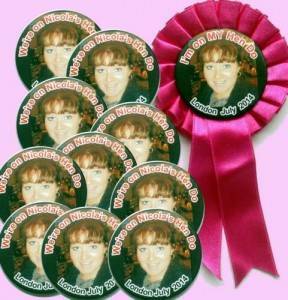 Packs of cheap party badges for your party. Our economy and cheap party badges packs enable you to get all your personalised items quickly. 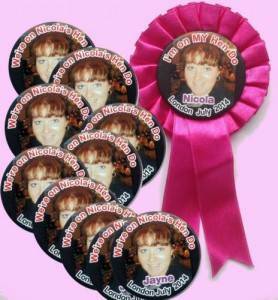 If you have more time then visit our fully customisable options for your badges, rosettes and sashes by clicking here. Choose from some of our more popular designs and then let us have the Bride's name, the venue and date - and get them to you next working day*. You can even add the guest names to each of the individual badges. Y ou can also choose a badge pack with a photograph - which costs an extra £1 - and you can also choose to add guest names if you wish. You can upload the photograph at the check out stage via the link that will be provided. 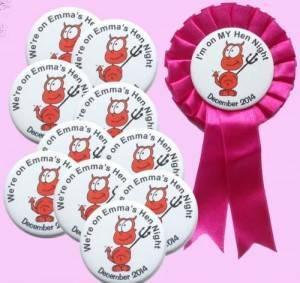 These packs are usually supplied for Hen Nights, but if you have another type of party then just let us know and we can offer a similar deal, for example, on birthdays or stag nights. 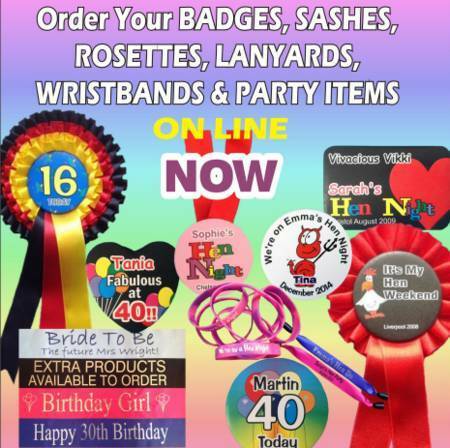 Once you have bought your badge pack items then you can then add other items such as wristbands, rosettes, lanyards and sashes. When you add extra items to your badge pack, there is no increase the postage - the postage remains the same as for the basic badge pack.